Welcome to the latest progress update. We’ve made major improvements to the application since our last announcement. The web version is buttery smooth and all of the components for the alpha are getting closer to ready. We’ve implemented profile features and have the basic peer review system working. Note: The peer review system for the invitation-only alpha will be fully revamped and upgraded in the Interstellar and Supernova releases. For the invitation-only alpha, we’ll be focusing on evaluating the core smart contracts of the system and addressing all bugs in the smart contracts and UI. We’ll be paying close attention to user behavior, and then using that information to upgrade the system’s mechanics in the later releases. Below are a couple teasers of the profile and review screens. The user interface for the Invitation-only Alpha has been greatly improved. We’re still making a few UI changes, but nevertheless we’re happy to say that everything is moving forward as planned. We’ll also be fine-tuning the number of required reviews as we gather feedback. There’s a tradeoff between time and accuracy of the peer review process. We also plan on implementing the mobile design below. The mobile version will be read-only, however, we plan to implement a write feature in future versions. Robert Rapant (Software Engineer) has joined the Lunyr team. Robert will be working with the rest of the Engineering team to further develop the architecture and design of the Lunyr application. The Lunyr Private Alpha will launch on September 18, 2017 on the Ethereum Mainnet. Lunyr is an Ethereum-based decentralized world knowledge base which rewards users with app tokens for peer-reviewing and contributing information. 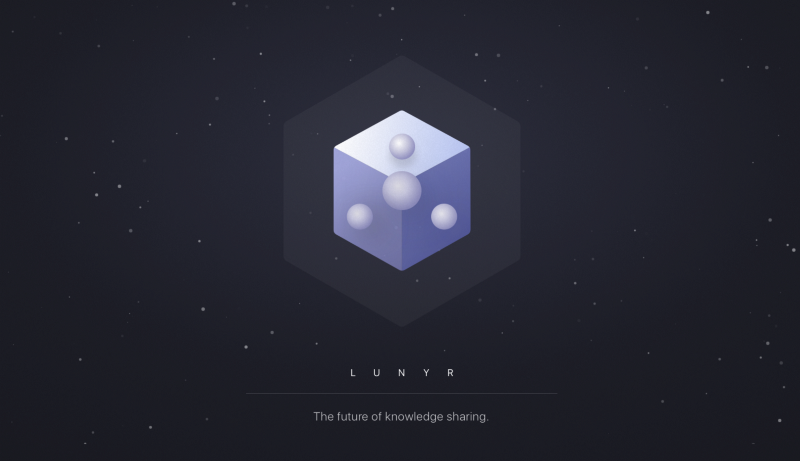 Lunyr’s long-term vision is to develop a knowledge base API that developers can use to create next generation decentralized applications in Artificial Intelligence, Virtual Reality, Augmented Reality, and more. 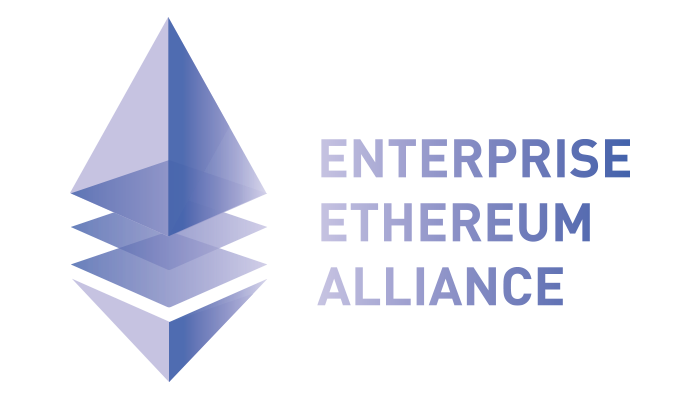 We would like to announce that Lunyr is now a proud member of the Enterprise Ethereum Alliance (EEA). We look forward to the journey ahead and working with others to contribute to this thriving industry. Welcome to another update! Today we’ll be discussing the roadmap for 2018. 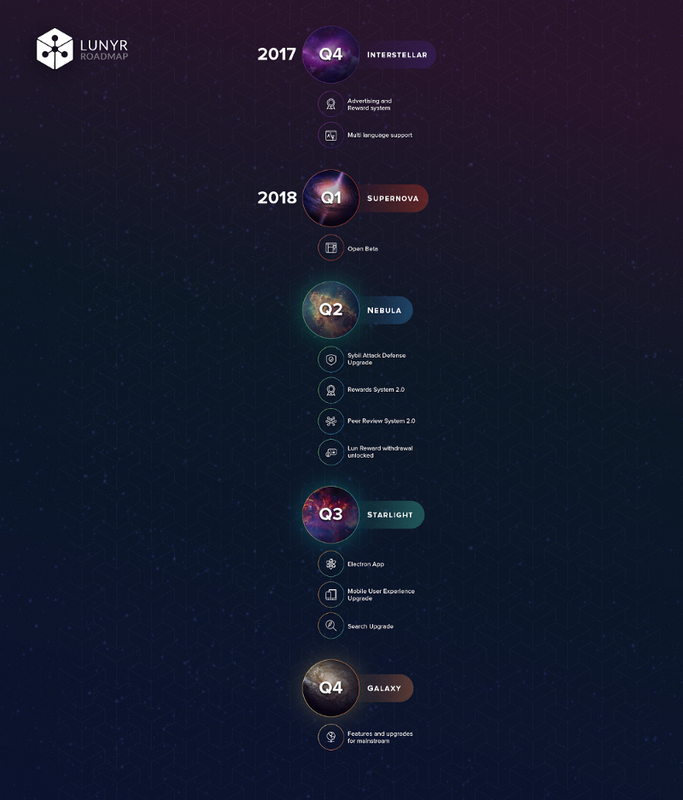 Interstellar introduces the advertising and reward system, completing the workflow for writers, readers, and advertisers. Advertisers will be able to spend LUN to advertise on the platform. Writers will be able to earn Contribution (CBN) points, but LUN withdrawals will be time-locked until the Nebula release in Q2 2018. We decided to time-lock the LUN withdrawals because the Peer Review and Reward Systems are still in primitive form, and won’t be polished until Nebula. Interstellar introduces multi-language support for Korean, Chinese, Russian, German, and Japanese. The Lunyr community is global and more languages will be supported in the future. In the Nebula release, all components of the system will be in polished form. During the Nebula stage, our focus will be on building a strong community of writers and generating high quality content. Afterward, the Starlight release will occur. The primary goal of Starlight is to drive readers onto the platform. By this stage, we should already have an active community of writers and a huge repository of useful articles. The Starlight phase will focus on improving the mobile and desktop experience for readers through the creation of native mobile and desktop dapps. SEO is also extremely important, so we will be upgrading the system for even greater searchability of Lunyr articles on the web. In Galaxy, a lot of quality of life upgrades will occur to make Lunyr more easily adopted by non-blockchain audiences. Greetings all Lunyrians! This week we’ve been working on the advertising system and user profiles. Both frontends are approaching completion. After completion, they will undergo security testing and then deployment. In the meanwhile, here is an example of the user profile page. It’s getting closer to the intended design. For any questions or feedback please post on https://www.reddit.com/r/Lunyralpha. 새로운 업데이트를 드리고자 합니다! 오늘은 루나의 2018년 로드맵을 공개하겠습니다. 인터스텔라(Interstellar)는 광고 및 보상 시스템을 도입하여 작가, 독자 및 광고주를 위한 워크 플로우를 완성합니다. 광고주는 플랫폼상에서 광고하기 위해 LUN을 지불할 수 있습니다. 글쓴이는 기여도(Contribution, CBN) 점수를 얻을 수 있지만 2018 년 2 분기에 네뷸라(Nebula)가 출시 될 때까지 LUN에 대한 인출은 보류됩니다. 이는, 동료검토(peer review) 및 보상 시스템(reward system)이 여전히 초기단계이며, 네뷸라 단계에 도달해야만 안정성을 확보할 수 있으므로, 이 단계까지 보류하기로 한 것입니다. 인터스텔라는 한국어, 중국어, 러시아어, 독일어 및 일본어에 대해 다국어 지원을 제공합니다. 루나 커뮤니티는 글로벌하며 앞으로 더 많은 언어가 지원 될 예정입니다. 네뷸라(Nebula ) 출시에서는 시스템의 모든 구성 요소가 더욱 세련된 형태로 나타날 것입니다. 이 단계에서는 매우 활성화된 글쓴이들의 커뮤니티를 구축하고 고품질의 콘텐츠를 만드는 데 중점을 둘 것입니다. 이 후 출시되는 스타라이트(Starlight) 에서는 독자를 플랫폼으로 유도하는 것에 중점을 둘 것입니다. 이 단계에 앞서 루나는 이미 활성화된 글쓴이들의 커뮤니티와 다량의 유용한 기사들을 보유하고 있어야합니다. 스타라이트 단계에서는 네이티브 모바일 및 데스크탑 탈중앙화 어플리케이션(dapp)을 개발하여 모바일 및 데스크탑 상의 사용자 경험을 개선하는 데 중점을 둡니다. SEO 또한 매우 중요하므로 루나의 기사를 검색하는 성능을 높이기 위해 시스템을 업그레이드 할 예정입니다. 갤럭시(Galaxy)에서는 블록체인을 모르는 사용자도 별다른 어려움없이 루나를 사용할 수 있도록 질적 향상을 위한 다양한 업그레이드가 이루어질 것입니다. 비공개 알파에 가입하고자 하는 사용자는 여기에서 가입 할 수 있습니다. 초대 된 테스터는 보다 상세한 설명이 포함된 이메일을 받게 됩니다. Happy holidays everyone! We are excited to announce that the Open Beta is set to launch on January 30, 2018. The Open Beta launch will represent a revolutionary breakthrough in the future of knowledge sharing. As we begin to establish the knowledge base, pretty soon the Lunyr API will come to fruition, which will allow developers to use the knowledge base as a backbone to create next generation decentralized applications in Artificial Intelligence, Virtual Reality, Augmented Reality, and more. The reward system will be released at the same time as the Open Beta. Writers will begin earning rewards for creating content, which will increase the readership on the Lunyr platform. In the early stages, Lunyr will serve as the go-to resource for reliable, easy-to-read and factual information about current and upcoming crypto projects. Once we grow a solid community of readers, we will aim to expand into other domains of knowledge including but not limited to innovative, bleeding edge topics in Finance, Law, Investment, Science, and Technology. After the Open Beta, Lunyr articles will begin showing up in search engines globally. This includes Google, Baidu, Bing, and Yahoo. We are currently developing multiple language support (Chinese, Korean, Japanese, German, Russian, etc.) 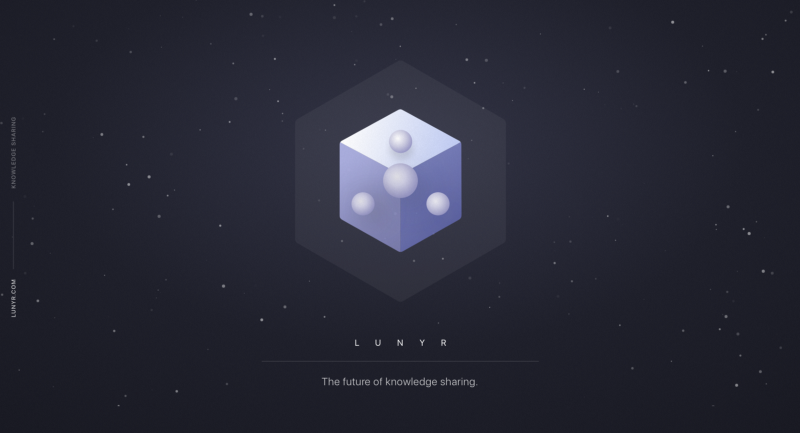 to achieve Lunyr’s goal of becoming a global censorship-resistant, decentralized knowledge base. Improving SEO and search relevance is on the roadmap. Now that Lunyr will become completely functional, there will be a tremendous increase in marketing and branding for the next several months to drive readers and writers onto the platform. Users interested in joining the Private Alpha can signup here. Invitations are sent weekly. Digital assets, innovative technologies, channels and systems are creating new paradigms in various industries. Blockchain, for example, is causing massive disruption in many industries with Bitcoin and other cryptocurrencies reshaping the traditional model of operations. In fact, studies indicate that, as of January 2018, the combined market value of all cryptocurrencies is $804 billion, which represents a level of value creation on the order of Silicon Valley success stories. Although Bitcoin remains the dominant cryptocurrency in terms of market capitalization, other cryptocurrencies are increasingly cutting into Bitcoin’s historically dominant market capitialization, which accounted for 72% as of March 2017. Ether (ETH), the native cryptocurrency of the Ethereum network, has established itself as the second-largest cryptocurrency. The combined “other cryptocurrency” category has doubled its share of the total market capitalization from 3% in 2015 to 6% in 2017. · The industry is becoming more fluid as the lines between exchanges and wallets become increasingly ‘blurred’ and a multitude of cryptocurrencies, not just Bitcoin, are now supported by a growing ecosystem, fulfilling an array of functions. But the bottom line is that these different cryptocurrency systems share common elements — the public ledger (blockchain technology) which is shared between network participants and the use of native tokens which incentivizes participants for running the network in the absence of a central authority. Blockchain is a shared, distributed ledger that facilitates the process of recording transactions and tracking assets in a business network. An asset can be tangible — a house, a car, land — or intangible like intellectual property, such as patents, copyrights, or branding. Virtually anything of value can be tracked and traded on a blockchain network, reducing risk and cutting costs for all involved. · A blockchain is digitally distributed across numerous computers in almost real-time — this means that blockchain is decentralized, and a copy of the entire record is available to all users and participants of a peer-to-peer network. This eliminates the need for central authorities, such as banks, as well as trusted intermediaries, such as brokerage firms. · A blockchain uses many participants in the network to reach consensus- That is, the participants use their computers to authenticate and verify each new block. For example, to ensure that the same transaction does not occur more than once. New blocks are only adopted by the network once a majority of participants agree that they are valid. · A blockchain uses cryptography and digital signatures to prove identity- this means that transactions can be traced back to cryptographic identities, which are theoretically anonymous, but can be tied back to real-life identities with some reverse engineering. · A blockchain has mechanisms to make it hard but not impossible to change historical records — That is, even though all data can be read and new data can be written, data that exists earlier in a blockchain cannot in theory be altered except where the rules embedded within the protocol allow such changes — for instance, by requiring more than 50 per cent of the network to agree on a change. · A blockchain is time-stamped — transactions on the blockchain are time-stamped, making it useful for tracking and verifying information. · A blockchain is programmable — this means that instructions embedded within blocks, such as “if” this “then” do that “else” do this, allow transactions or other actions to be carried out only if certain conditions are met, and can be accomplished by additional digital data. Blockchain technology is surely set to revolutionize traditional business networks. With traditional methods for recording transactions and tracking assets, participants on a network keep their own ledgers and other records. This traditional method can be expensive, partially because it involves intermediaries that charge fees for their services. It’s clearly inefficient due to delays in executing agreements and the duplication of effort required to maintain numerous ledgers. It’s also vulnerable because if a central system (for example, a bank) is compromised, due to fraud, cyberattack, or a simple mistake, the entire business network is affected. But with the blockchain technology, the participants are given the ability to share a ledger that is updated, through peer-to-peer replication, every time a transaction occurs. Peer-to-peer replication means that each participant (node) in the network acts as both a publisher and a subscriber. Each node can receive or send transactions to other nodes, and the data is synchronised across the network as it is transferred. The blockchain network is economical and efficient, because it eliminates duplication of effort and reduces the need for intermediaries. It is also less vulnerable because it uses consensus models to validate information. Transactions are secure, authenticated, and verifiable. Blockchain technology has been gaining greater application and adoption as various companies have raced to the space to build straightforward and unique systems for users. One example of a viable system that is hitting the mainstream is LUNYR. 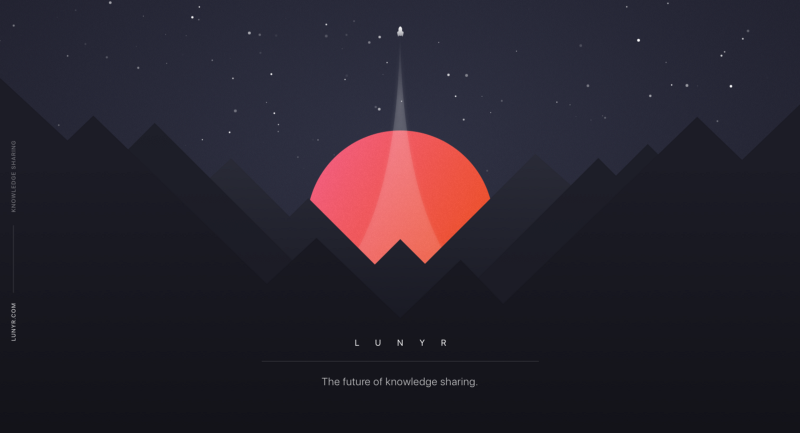 Lunyr is an Ethereum-based decentralized world knowledge base (think a decentralised wiki) which rewards users with app tokens for peer-reviewing and contributing information. The system aims to be the starting point of the internet for finding reliable, accurate information. Lunyr’s long-term vision is to develop a knowledge base API that developers can use to create next generation decentralized applications in Artificial intelligence, Virtual Reality, Augmented Reality, and more. Many projects and companies have emerged to provide products and services that facilitate the use of cryptocurrency for mainstream users and build the infrastructure for applications running on top of public blockchains. The existence of these services adds significant value to cryptocurrencies as they provide the means for public blockchains and their native currencies to be used beyond in the broader economy. This means that we should stop viewing blockchain simply as a fad but more as the transparent public ledger technology it is. We must view the technology within the context of its use. Greetings everyone! We have a wonderful announcement that the withdraw of Lunyr (LUN) token from Contribution points will now be enabled March 1, 2018, three months earlier than planned. Previously, we had decided to time-lock it for four months after the Open Beta. However, due to major breakthroughs in our platform, it will now be enabled earlier. Thus, after the Open Beta, you will now be able to earn Contribution Points and turn them in for LUN immediately after a month for sharing and peer reviewing information. NOTE: LUN IS FIXED SUPPLY AT 2.7M. CONTRIBUTORS ONLY GET LUN FROM THE ADVERTISING REVENUE IN THE LUN POOL. THERE IS NO INFLATION MODEL. EVERY TIME LUN IS REWARDED, MORE VALUE IS BEING ADDED INTO THE SYSTEM THROUGH INCREASED CONTENT AND QUALITY. We are still sending out Private Alpha invite codes. Users interested in joining the Private Alpha can signup here. Invitations are sent weekly. Which looks the best to you? Comment Below! We’re excited to announce that the Lunyr Open Beta will start with a prize pool of more than $200,000 in LUN rewards over 2018. Contributors will compete for LUN rewards by writing or peer reviewing articles to earn Contribution Points, which can be turned in for LUN through the Lunyr platform. Note: LUN Rewards withdraw will not be enabled until March 1, 2018. A Decentralized Wiki- Is It Possible? According to Vitalik Buterin, the term “decentralization” is one of the words that is used in the cryptoeconomics space the most frequently, and is often even viewed as a blockchain’s entire raison d’etre. Blockchains are politically decentralized (no one controls them) and architecturally decentralized (no infrastructural central point of failure) but they are logically centralized (there is one commonly agreed state and the system behaves like a single computer). Fault tolerance- This means that decentralized systems are less likely to fail accidentally because they rely on many separate components that are not likely to fail. Attack resistance- Decentralised systems are more expensive to attack and destroy or manipulate because they lack sensitive central points that can be attacked at much lower cost than the economic size of the surrounding system. Collusion resistance- this means that it is much harder for participants in decentralized systems to collude to act in ways that benefit them at the expense of other participants, whereas the leaderships of corporations and governments collude in ways that benefit themselves but harm less well-coordinated citizens, customers, employees and the general public all the time. These are some of the benefits of blockchain especially when it comes to decentralization, and so, the burning question is- is decentralisation possible in knowledge sharing, in other words, is a decentralised wiki possible? Most people will view this simply as a fad but the truth is that the modern enterprises of the knowledge industry has really fallen short, with centralized platforms retaining most or all of the revenue generated from the knowledge producers and sharers using their platforms. While some platforms do financially reward its users for knowledge sharing, such as Steemit, they seem to be unable to provide a way to effectively measure the quantity and quality of knowledge shared. We all need knowledge at all times, as peer consumers might get knowledge online that helps them connect to the proper resources, experts, and partners to address the needs of their projects. As a result, individuals can perceive that they can conduct business in novel ways and become peer producers such that they might consult with anyone else and get (extra) income with their high-added-value knowledge services. Therefore, as cryptocurrencies gain greater application and adoption, various blockchain companies are already racing to the space to build straightforward platforms that will enable multilateral knowledge empowerment, i.e. knowledge into action, of the highest added value. Lunyr is an Ethereum–based decentralized crowdsourced encyclopedia which rewards users with app tokens for peer-reviewing and contributing information. The platform aims to be the starting point of the internet for finding reliable, accurate information. Lunyr’s long-term vision is to develop a knowledge base API that developers can use to create next generation decentralized applications in Artificial Intelligence, Virtual Reality, Augmented Reality, and more. Being decentralized, censorship-resistant, and autonomous, no single point of failure exists. No central authority or middleman owns or can corrupt the information. The rules in which people interact with the knowledge base and with one another are mutually agreed upon and enforced through smart contract, which are publicly verifiable on the blockchain. A strategic component of the Lunyr platform is its advertising system, which allows for the purchase of advertising on the platform using Lunyr tokens (“LUN”). Although the Lunyr platform is unique in its design, decentralization, and vision, it can be compared to Wikipedia. Wikipedia today ranks as the sixth most visited site in the world according to Alexa rankings. It attracts 470 million unique visitors who view over 19 billion pages per month. But unlike in Wikipedia where volunteers donate their time to contribute and validate information, in Lunyr’s platform, contributors are rewarded for their work and are incentivized to continue increasing the value of the ecosystem. All content submissions go through a mandatory peer review process and are not committed to the knowledge base until validated for reliability and accuracy. A powerful incentive system enabled by app tokens ensures that peer reviewers act in the best interest of the ecosystem. Additionally, LUN are used to place advertisements on the platform. The ads are text-based such as those seen in Quora. Ads are not committed to the platform until they pass through the mandatory peer review system. Ads are a crucial component of the Lunyr ecosystem as they create a powerful demand for LUN from those with financial resources. Ads provide the economic force that drives network effects as more contributors and readers join the ecosystem. Blockchain is particularly valuable at increasing the level of trust among network participants. Because every activity/transaction build on every other activity/transaction, any corruption is readily apparent, and everyone is made aware of it. And when decentralized blockchain protocols start displacing the centralized web services that dominate the current internet, we’ll start to see real internet-based sovereignty. And despite the blockchain technology being in its relative infancy, the first breakout apps will be explosive because they financially incentivize users to participate in the network. Imagine being able to actually make money when you share your knowledge. Greetings everyone! The Lunyr community has been increasing by several fold as we approach the Open Beta launch. For the past several weeks, we’ve been working out all the kinks in the system. A major problem we’ve encountered is the high gas fee for using Ethereum. Although the Ethereum ecosystem is currently working on scaling solutions that will reduce gas fees, it will take a while before they’re implemented. In the meanwhile, we’ve designed a reimbursement strategy to eliminate the gas fees for users until they become sustainable. Starting from the Lunyr Open Beta, publishing and peer reviewing articles will be completely free. Users will still have to submit each transaction but the gas fee will be fully reimbursed. Reimbursements for costs will automatically occur at the end of each week. This should result in a dramatic increase in the usability of the Lunyr platform. The Open Beta launch on January 30, 2018 is a giant leap forward in the Lunyr vision. Incredible growth remains ahead with upcoming features and the Lunyr API. After the Lunyr Open Beta launch, we expect to see more community members and valuable articles on the Lunyr platform. Attention all Lunyrians! Last week we were working on upgrades to solve a few issues with the Lunyr platform. We’ve made a breakthrough in our technical architecture which will reduce gas fees by 40%. Although our reimbursement program will continue to cover 100% gas fees for all users, this new upgrade should reduce long term costs and lead to increased sustainability. We hope to launch the upgrade near the end of this week or next week. Welcome to another Lunyr Dev Update! We’re excited to announce that all tests for reward system have successfully passed and we are on track for the Open Beta launch on January 30, 2018! The Open Beta launch will be a revolutionary breakthrough in the future of knowledge sharing. As we grow the knowledge base, the value of the Lunyr API will also begin to grow, which will allow developers to use the knowledge base as a backbone to create next generation decentralized applications in Artificial Intelligence, Virtual Reality, Augmented Reality, and more. Since the announcement of the Lunyr Open Beta, we’ve been executing our long term community growth strategy. So far our strategy is working phenomenally. The results are clearly felt throughout all our social media channels. We’ve grown by more than 1200% since the beginning. Much work remains but we are moving closer and closer to the future of knowledge sharing. The Lunyr platform is looking better every day and we’re already beginning to see valuable content. After the Open Beta, Lunyr articles will begin showing up in search engines globally. We’re redesigning the homepage to make content immediately consumable. January 30, 2018 — California, USA — Blockchain-based knowledge sharing platform Lunyr launches Open Beta which will initially offer more than $200,000 in rewards for writing, editing, and peer reviewing information. Now running live on the Ethereum blockchain mainnet, the Lunyr Open Beta represents a revolutionary breakthrough in the future of knowledge sharing. 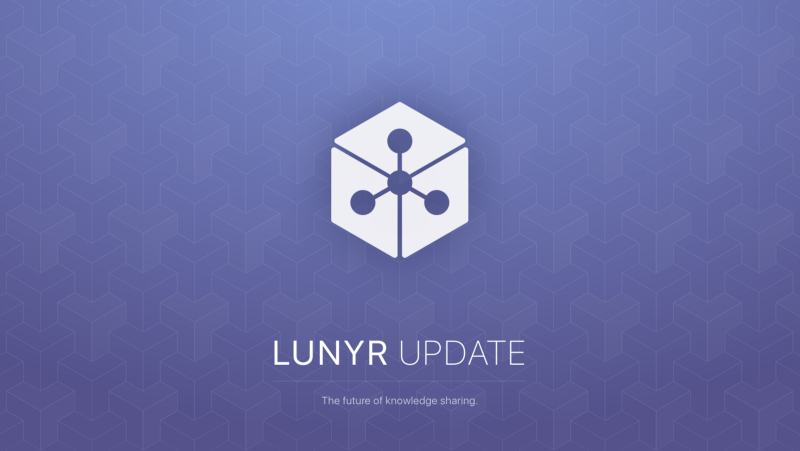 As the knowledge base grows, so will the value of the Lunyr API, which will allow developers to use the knowledge base as a backbone for creating next-generation decentralized applications in Artificial Intelligence, Virtual Reality, Augmented Reality, and more. After the Open Beta, Lunyr articles will begin showing up in search engines globally including Google, Baidu, Bing, and Yahoo. Lunyr is currently developing multiple language support (Chinese, Korean, Japanese, German, Russian, etc.) to achieve its goal of becoming a global censorship-resistant, decentralized knowledge base. Advertisers will now be able to advertise on the Lunyr platform through the purchase of Lunyr tokens (LUN), an ERC20-based token on the Ethereum platform. LUN can be obtained either from the Lunyr platform’s reward system or exchanges such as Binance.com, Huobi.pro, Bittrex.com, Gate.io, Big.ONE, and HitBTC.com. Welcome all to another Lunyr Update! We’re very pleased to announce that we have a barrage of updates this week. We improved the backend so that querying the content is now 15x faster than before. The article query time used to be ~3 seconds and has gone down to ~100–200 ms.
Added a confirmation page to indicate to a user they have completed something successfully as well as still providing the transaction hash to look up in Etherscan.io. We have started work on web app mobile responsiveness as well as looking into the infrastructure to support our react native development around the ios/android apps. Contrary to our assumptions, a vast number of articles have not been searchable on Google. We have found the root cause and have been implementing server side rendering to make content indexable by Google. All articles should start appearing on Google after completion of server side rendering. Fixed a bug in the create ad page that was not calculating the max possible bid that could be made. Fixed the bid restriction of integers only and made sure we can input proper float values for bids. That’s all for this weeks update! Expect more exciting updates coming soon! Click here to get paid for writing and peer reviewing articles! Hi everyone! Welcome to another Lunyr update. We’re proud to share our progress for the past couple weeks! We will be broadening our audience soon through the release of a Lunyr desktop dapp for Mac. The Lunyr Windows dapp will be released shortly afterward. The first version of the desktop versions will require some testing so we’re looking for beta testers who can help provide feedback and hunt for bugs. After the release of the Desktop dapps, we plan on releasing Lunyr on Iphone and Android. The expected timeline for release is 2–3 months. One of our goals to improve the quality of articles on Lunyr platform will be to establish best practices and standards. We will be releasing a writing manual on April 4, 2018. Writers and peer reviewers will soon have a reference to follow while evaluating articles. The overall article and peer review quality should improve afterward. Writers will soon be required to demonstrate an acceptable level of competence for writing and peer reviewing before they’re allowed to publish and peer review content. We will be releasing courses and exams. These requirements should drastically improve the article quality. We’ve dramatically cut our bundle size so that the initial load of our dapp at least 2x faster. There should be a significantly noticeable improvement in the load speed of all pages and content on the Lunyr platform. We are now fully up-to-date with all reimbursements up until March 16th. Reimbursements will be sent out every Friday-Saturday. The Lunyr Dapp is now available for download on Mac OS and Linux. Support for Windows will be available in the next couple weeks. Please access the downloads here. Hello everyone! Welcome to another Lunyr update! We’ve been hard at working and finally ready to share exciting news on the Lunyr platform. All navigational items will be set to that new language and your feed will reflect the articles written in your selected language. Note: because this is new functionality, any articles written before internationalization support was implemented will be considered English by default. As soon as an article is edited, it will reflect its correct language. We look forward to hearing your feedback as we roll out this functionality within the Chinese and Spanish communities and extend to additional languages in the future. If you have any suggestions on future language expansion please reach out to our community on Telegram and Discord and let us know. Mobile apps have been written. The Android version is currently up and available on the Google Play Store for immediate download. The iPhone version has been submitted to Apple for review and will be available in the next few days. Note: the mobile applications lag in feature set to the desktop and web based apps by about a week or two. So, if you see functionality in the web, but not the app, it will be there shortly. The iOS app has been submitted to the Apple Store and is still undergoing review. Once approved by Apple, the community should be able to download it. We are proud to announce that you can now access the content and titles of our articles through our public API. We will no longer be issuing reimbursements for gas. This will take effect starting 12:00 am Pacific time on May 10, 2018. Now, you can withdraw LUN whenever you want. To kick off the process, go to your wallet and select Send Funds. As mentioned in our last dev update, the writing manual is now available. This will help ensure that everyone is aware of how to write and the expectations of peer review which should lead to much higher quality articles. To get to our writing manual, simply click on the Writing Manual link on the menu. We have implemented the design changes for viewing our site on your mobile web browser for much better usage, but we highly recommend that you use one of our mobile apps for a smoother experience.